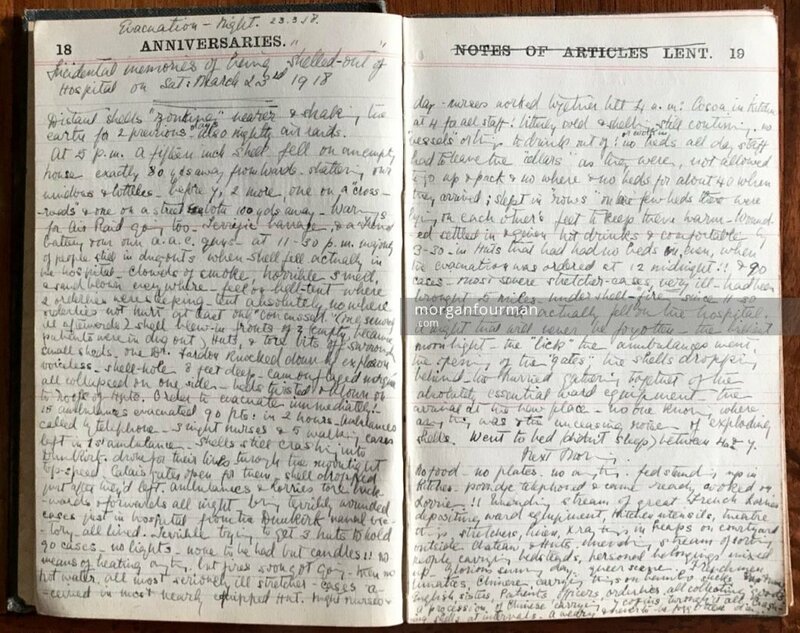 The following is a narrative account from the diary of Molly Evans, a VAD nurse in the Queen Alexandra Hospital, Dunkirk. She had returned from leave on 17 Mar and the three days from 20 to 23 March 1918 were the worst experienced so far. 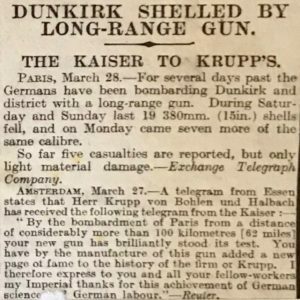 She wrote up a special piece in the diary to describe it, starting on the evening of 20 Mar 1918. Air Raid began at about 8 pm as moon came up & we were preparing for bed. As shrapnel was bursting very near & ‘bits’ flying ‘through’ walls & roof, it compelled us to go to a ‘cellar’. Some heavy stuff dropped. Bitterly cold in cellar, everyone talking & reading papers & sketching ‘sketchy’ bits. 2 candles. Whenever anyone attempted to go up, ‘Zonc’ went the bombs & ‘Mournful Mary’ wailed in accompaniment to the blaring blast of the ‘Cow’ (sirens). This lasted till about midnight, when the low flying Hun took his humming infernal machines home to bed & we followed suite! only to be awakened again at 4 am by the most deafening explosions, screaming shells, brilliant flashes & terrific earth splitting noises & shattering ‘falls’ that shook us nearly out of bed. I sat up & said “Naval Bombardment, cellar no use”. Terrific & terrible shells upon shells shrieking over our heads. Doors opened on all sides & voices of the sisters hurrying down to the cellars. Someone, a newcomer, rushed into our room & said “What on earth’s this?” A shower of crimson star shells lit up the whole place, followed by an increased fury of shelling. Shrapnel began coming ‘through’ so went down to cellar again. Only lasted 20 minutes but quite suffi[cient]. Back to bed again to lie & listen to the most appalling din of an obvious sea fight going on just outside. Awful to lie still, the thuds shaking the earth & the noise colossal, although the shells were no longer bursting over us, but evidently out to sea. One shut one’s ears so as not to hear, but the vibration came down the iron bedstead. We were terribly anxious as to the result. It went on for a couple of hours & not till we had been on duty for an hour did we hear the result. When the stretchers came in bringing the wounded sailors, when we heard it was a victory for us!! Theatre going all morning, amputations. One ‘hold’ with 7 men inside unable to be opened until the ship was ‘docked’  they all be scalded to death. Fearful indignation against the French who lost their heads & rammed them by mistake & not the Hun. Great rejoicing over the Victory in hospital & with so small loss to ourselves. Several women killed by bombardment & several houses flat with the earth, but on the whole considering the length & severity of the shelling the damage was light. Distant shells ‘zoncing’ nearer & shaking the earth for 2 previous days also nightly air raids. At 5 pm a fifteen inch shell fell on an empty house 80 yards away from the Wards shattering our windows & bottles. Before 7, two more, one on a cross roads & one on a street, both 100 yards away. Warnings for Air Raid going too. Terrific barrage, a French battery & our A.A.C. guns. At 11.30 pm majority of people still in dugouts when shell fell actually in the hospital. Clouds of smoke, horrible smell & sand blown everywhere. Fell on bell-tent where 2 orderlies were sleeping. Tent absolutely nowhere. Orderlies not hurt, at least only ‘concussed’ (one seriously ill afterwards). Shell blew in fronts of 2 (empty because patients were in dug-out) huts & tore bits off surrounding small sheds. One Dr Fardon knocked down by explosion, voiceless. Shell hole 8 feet deep, camouflaged morgue all collapsed on one side, beds twisted & blown on the roofs of huts. Order to evacuate immediately! 15 ambulances evacuated 90 patients in 2 hours. Ambulances called by telephone. 3 night nurses & 5 walking cases left in 1st ambulance. Shells still crashing into Dunkirk, drove for their lives through moonlight top speed. Calais gates open for them. Shell dropped just after they left. 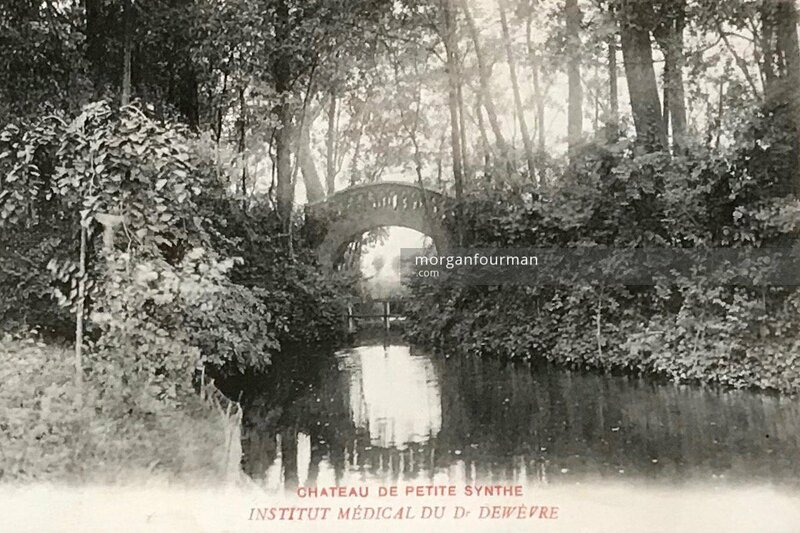 Ambulances & lorries tore backwards & forwards all night, bringing terribly wounded cases, just in hospital from the Dunkirk naval victory, all lived. Terrible trying to get 3 huts to hold 90 cases, no lights, none to be had but candles!! No means of heating anything, but fires soon got going. Then no hot water. 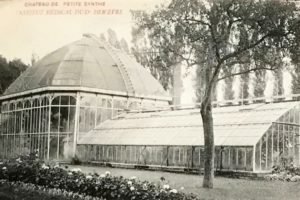 All most seriously ill stretcher cases received in most nearly equipped hut. Night nurses & day nurses worked together till 4 am. Cocoa in kitchen at 4 for all staff! Bitterly cold & shelling still continuing. No vessels or things to drink out of or cook in! No beds, all day-staff had to leave the cellars as they were, not allowed to go up & pack & nowhere & no beds for about 40 when they arrived. Slept in rows on the few beds there were, lying on each others feet to keep them warm. Wounded settled in & given hot drinks & comfortable by 3.30 in huts that had had no beds in even, when the evacuation was ordered at 12 midnight! 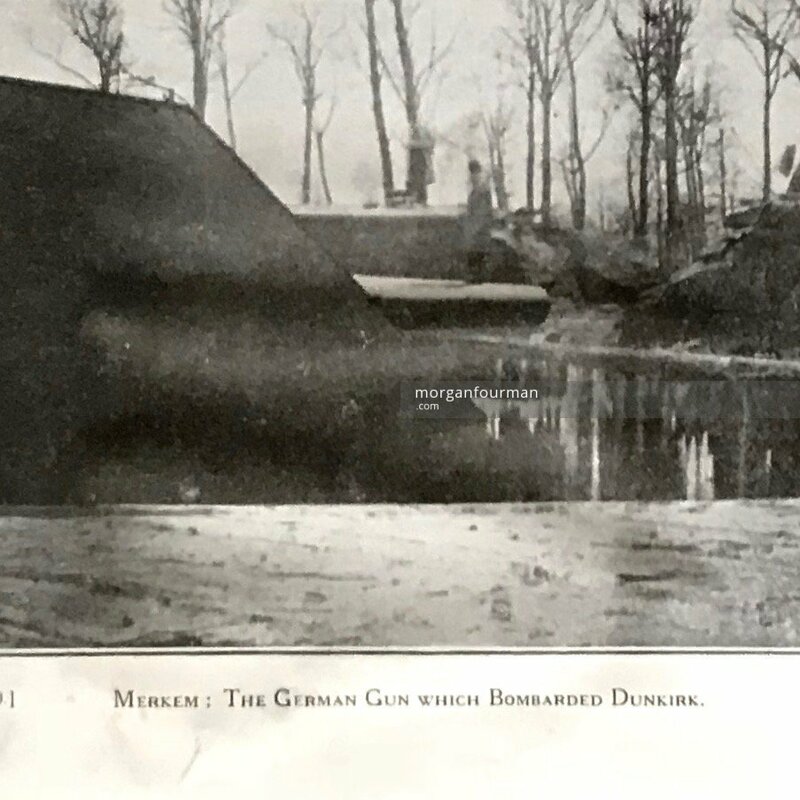 & 90 cases, most severe stretcher cases, very ill, had been brought 5 miles under shell-fire since 11.30 when the shell actually fell on the hospital. 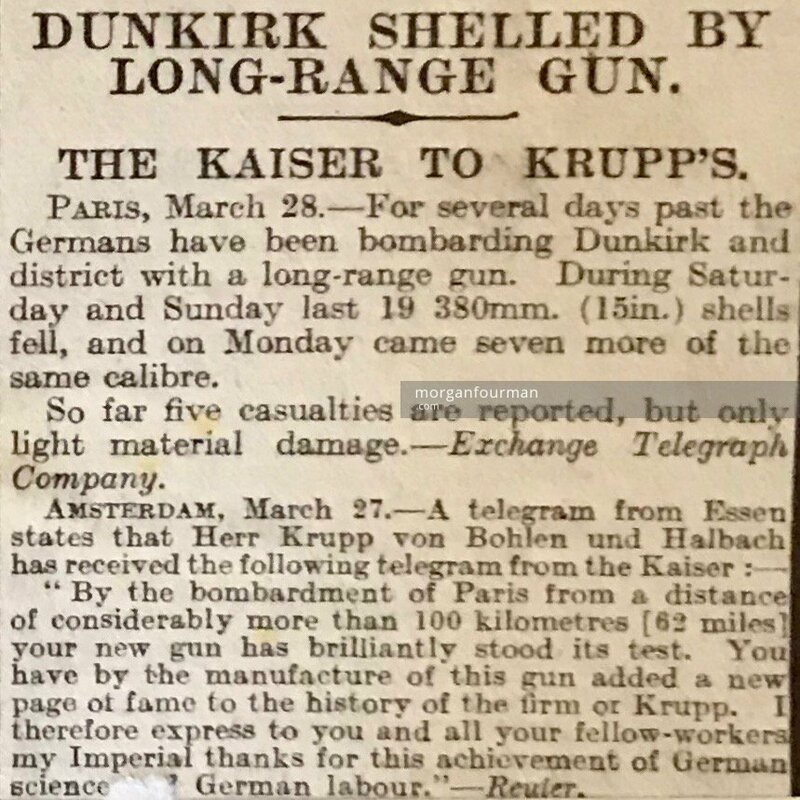 A night that will never be forgotten – the brilliant moonlight, the ‘lick’ the ambulances went, the opening of the ‘gates’, the shells dropping behind, the hurried gathering together of the absolutely essential ward equipment, the arrival at the new place, no-one knowing where anything was & the unceasing noise of exploding shells. Went to bed (didn’t sleep) between 4 am & 7. No food, no plates, no anything. Fed standing up in kitchen, porridge telephoned & came ready cooked on lorrie!! 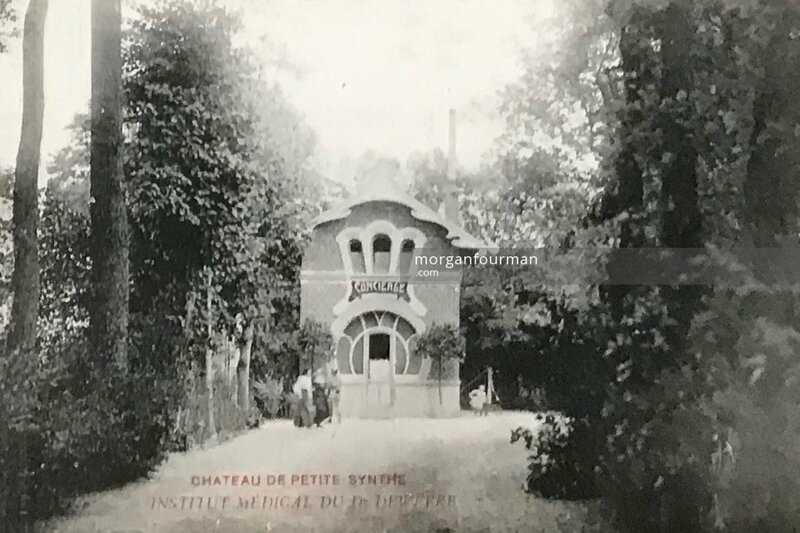 Unending stream of great French lorries depositing ward equipment, kitchen utensils, theatre things, stretchers, linen, X-ray things in heaps on courtyard outside Chateau & huts. Unending stream of sorting people, carrying bedsteads, personal belongings, mixed up. Glorious sunny day. Queer scene. Frenchmen, lunatics, Chinese carrying things on bamboo sticks, nuns, English sisters, patients, officers, orderlies, all collecting ‘goods’, a procession of Chinese carrying 7 coffins through it all. Crashing shells at intervals. A weary & never-to-be-forgotten day. 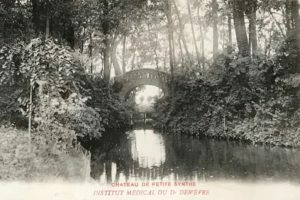 The Chateau at Petite Synthe, to which the hospital was evacuated, was already a base for the FAU. The original hospital site in Malo which was under attack was to the more exposed North East of the town. 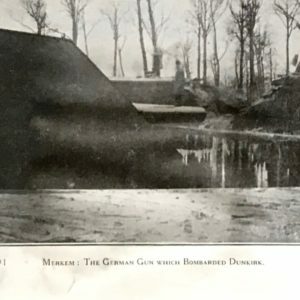 Molly and colleagues visited the site of the large German gun on their trip into ‘No Man’s Land‘ on 11 Dec 1918.